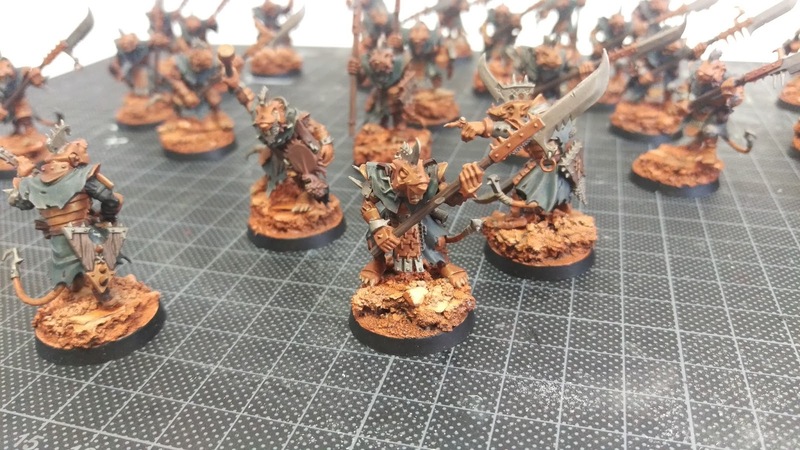 It has been some time since my last entry but I'm happy to report that my stormvermin are done with bases and varnish. Some time in the future I will put satin varnish on the metals as they are quite dull right now. For April I will focus on building and painting two magnetized warp-lightning cannons. Month 2 eh? Wow this comes around fast! 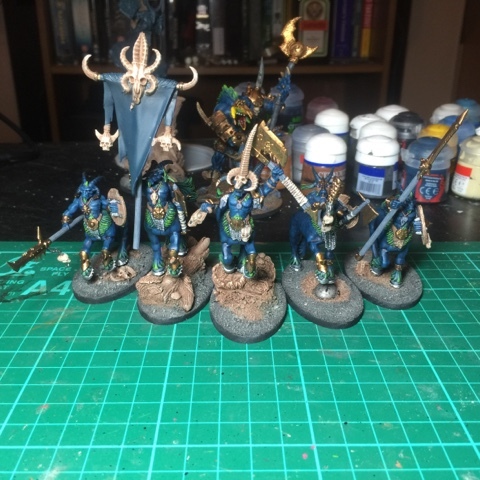 Been having a great time playing AoS but not got much painted, a few more warriors that's it. I got a few more things built to play again this weekend but I'll not bore you with more grey plastic, no matter how cool it is! 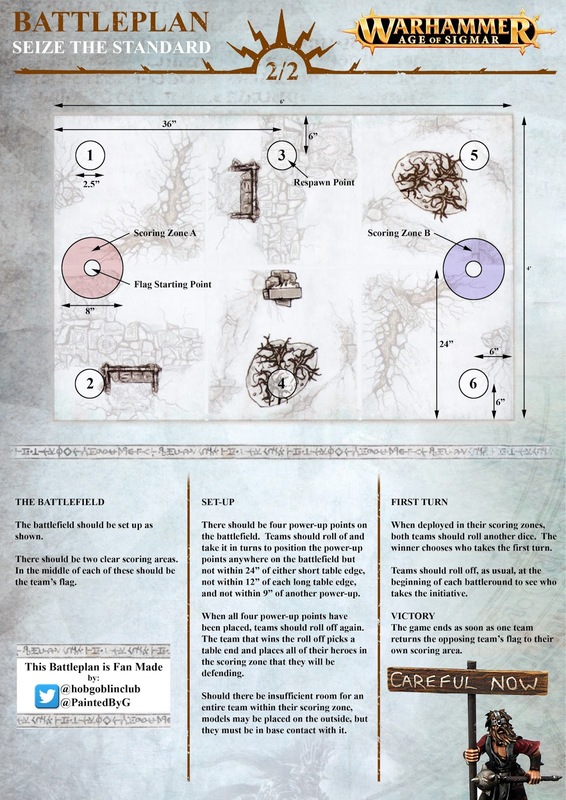 I spent a good proportion of my hobby-time this month co-creating (and building for) a custom BattlePlan! So I'll show that off this month.. painted minis next month I promise! So every year on or around the 16th of March (put it in your diary) I host a day of Birthday Nerdery. 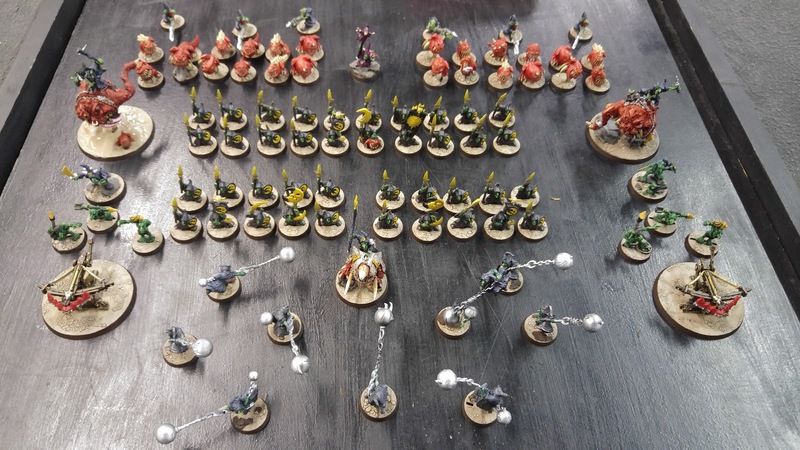 We normally play HeroQuest or Decent but this year I wanted to do something Age of Sigmar.. this presented a problem however.. we've now got around 8 people playing, so we needed to come up with something that we can all play together.. Spent a lot of hobby time making it this pretty! It's designed to be played with about 6-8 Heroes per side. We used the SCGT Pools choices to balance at 60 Pools per team. With the amount of players we had, that meant about 2 each.. Unless you take The Green Knight.. in which case, that's all you get! It's basically Capture the Flag. Each team has to capture the opponent's team flag and return it to their own scoring zone, whilst defending their own. Heroes only and no Monsters. Models that die re-spawn at 1 of 6 randomly decided zones. Power ups! Move over a power-up token and get a random bonus! 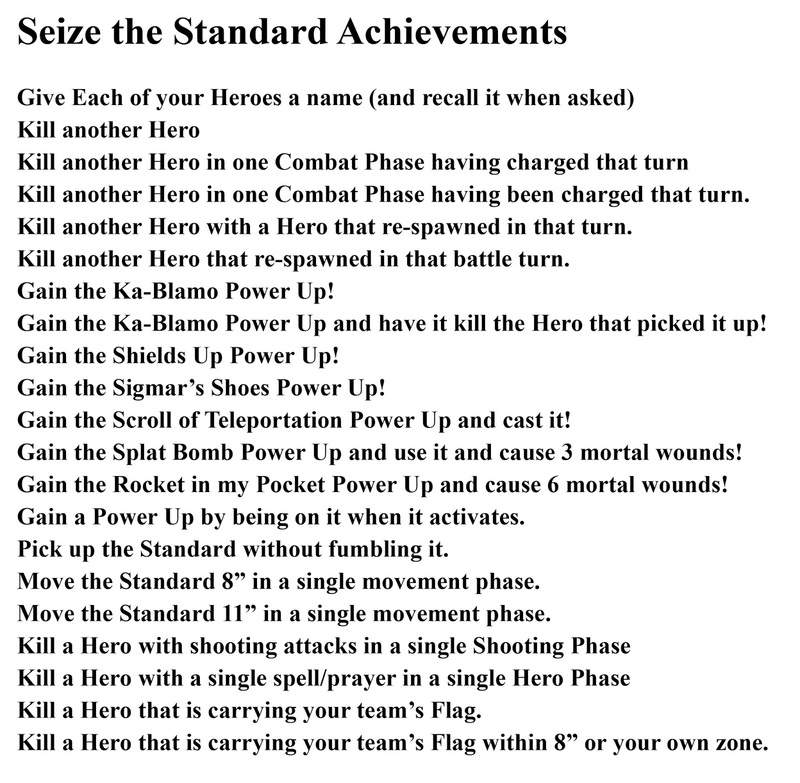 As this was for a party-game I wrote list of achievements for players to accumulate. Even gave out prizes (from the charity shop) which had in-game bonuses too! Highlights included the Village People's Crown of Sorcery and the Cravat of Khorne! I had some fun making extra terrain and tokens. Scroll of Teleportation, Splat Bomb and Rocket in my Pocket! 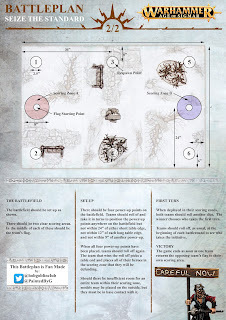 We had a great time playing this so if you fancy an AoS party game give it a go! 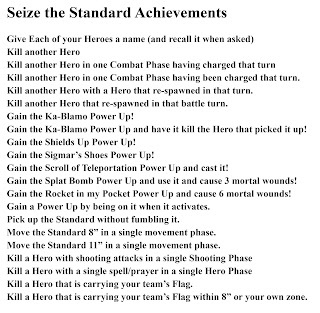 Rules written by myself and Steve HobgoblinClub <<Add him on Twitter! Here's some pics the game we played! Malagor Seizes the Team Pigs Standard! Steve donning his Crown of Sorcery! Mrs G leaning on the table (grr), while Pete points at a lamp. Iain sporting his Cravat of Khorne! Atmospheric shot of Skulltaker showing off. Yes. Turns out a Chariot can have the Hero Keyword! Deathmaster Snikch 1 turn away from winning the game! The Green Knight racing back with the Team Unicorn Flag! Thanks to being able to complete an unlikely charge, The Green Knight ends up going round him and landing on the scoring zone! Win for Team Pigs! Just! My aims this month were to paint 5 Liberators, a Heraldor, Knight-Venator, Relictor, Gryph-hound and Lord Castellant. Sadly, I did not achieve as much as I had hoped, having a very busy month (stag dos coming out the wazoo). Building wise, I built 10 Tomb Guard, a Tomb King, 3 Necropolis Knights, the Heraldor and Knight-Venator. Painting wise all I could complete was the base colours on the 5 Liberators. 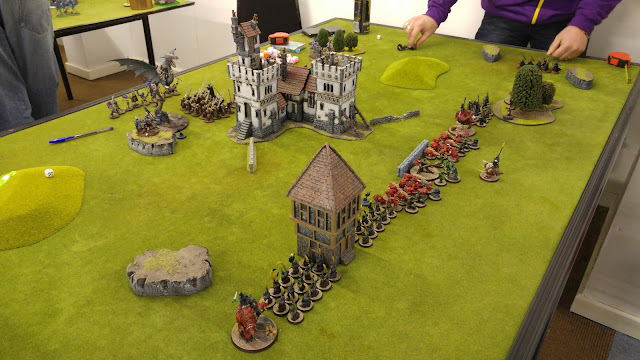 Gaming wise, I did get a good 4 player game in, introducing a couple of people who were non-gamers/40k players to Age of Sigmar with great success (we played with SCGT comp). I have another game tonight! Therefore my target this month will remain the same as previously - get the above models painted! Let's hope April is a bit more productive! In terms of purchases, I was £5.50 over budget from March. My April spending is already spent - I could not resist a few "last chance to buy models" from the Order Grand Alliance - Markus Wulfhart (£10), Orion, King of the Woods (£23.50) and Lokhir Fellheart (£8.20). These totalled £41.70 meaning that I am now under budget by £2.80. However, in the coming months I will need to slow down my purchases as I do not want a backlog - mentally this will slow down any progress at all. Therefore, I might take a break from purchasing new models until I have got all my Stormcast and Tomb Kings painted at least. Here's to a more productive next month! First post in a while. For those of you who saw my first post, don't worry, I haven't abandoned the way of the Herdstone! I've got grand plans for my Beastmen, something hopefully unique and different and very "Age of Sigmar". More on which in a future update. The reason for my recent radio silence is working on two armies to tight deadlines. As I've not got much in the way of Beastmen progress to share, I thought I'd make a couple of posts with my speed painted armies. After all, any hobby is good hobby, right? A friend of mine got in touch to say one of his team had dropped out of the Firestorm Fours tournament held at Firestorm Games in Cardiff. Not wanting to let the fact that I didn't have an army and there were only a few weeks to go get in the way of a weekend of wargaming, I signed up. I had a few armies in various shades of sprue grey, undercoat white or even unassembled, but I quickly worked out that there was only one real option. 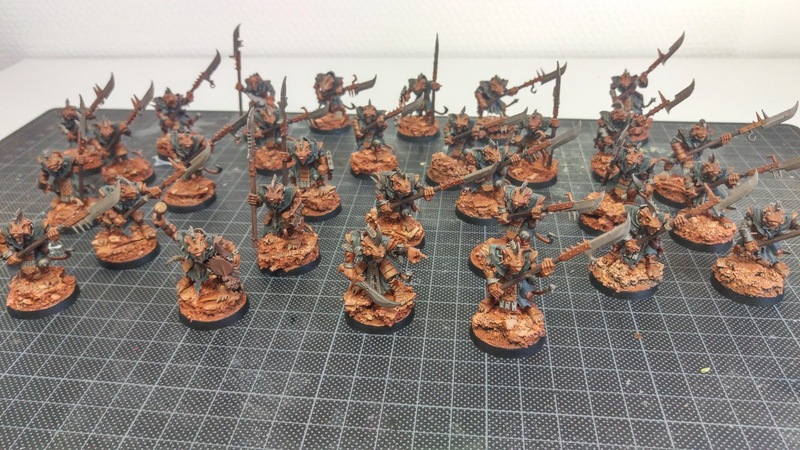 I had a Night Goblin army sat in my garage from a while back. The army consisted mostly of Skull Pass Night Goblins and a metric tonne of Squigs. The best things (well, one of the many awesome things!) about Night Goblins is how easy they are to paint. Using a quick and dirty scheme of block colours and a bucket of Army Painter dark tone. 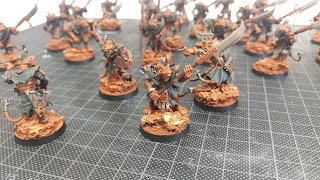 The Squigs were painted using Army Painter Dragon Red spray, a quick touch of Ushabti Bone and shaded in the same way as the Gobbos. I got to painting right away and with a mere fortnight remaining, the Moonclan was starting to take shape. With one week to go, the army started to look almost complete. Luckily, I had the models I wanted so did my need to spend any extra money on this army (which was an eBay special anyway). Not only that, but units like Mangler Squigs and Fanatics have a low amount of models for their pool cost, so I was happy to have less models to paint due to investing in some heavy hitters. I was painting right up to the day of the tournament. In fact, I was painting Agrellan Earth onto my second Mangler Squig's base at 8.30am on the day of the tournament. 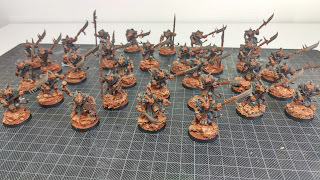 All in all, I enjoyed the furtive painting journey with this army, and I've never had a complete Fantasy army before so this was an enjoyable first. The army was never going to win any painting awards, but it was complete. Here's the Moonclan in all its glory. It didn't perform particularly well, as I lost every game. I put that down to lack of experience of the game, rather than the list being poor. I wouldn't want to blame the Gobbos when it was me that led them to defeat! Stay tuned for an update on another army speedy project soon, as well as more information on my Beastmen for the tale itself. It's a bit late to introduce my plans for March, but I'm spending most of the month out of the country with little time for writing and painting... But better late that never ! I'm therefore expecting to get this month's Wardens fully painted by the first week of April rather than the end of March. 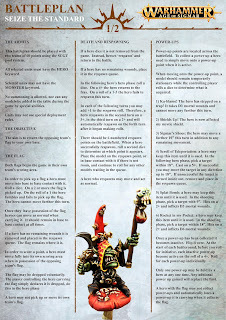 The moment I read the Knight-Vexillor warscroll, I knew I wanted one with the teleport ability, in order to deepstrike the powerful but slow Paladins where they are most needed. I fits with the fluff of my Stormhost, trying to cover the nevralgic points of the Realms and secure the conquered assets. Talking about Paladins, my first choice for an extra unit of these was a no-brainer : Protectors ! Besides being probably the strongest of their kind (protection from ranged attacks + 3" control + monster slayers), they're are exactly what the Wardens of the Realms are about ! I'll get the badass axes another time. I knew I wouldn't have much painting time this month, so a 6 models goal shouldn't be too hard to achieve... And it's a step forward towards another warscroll battalion, that I should introduce to you in April. 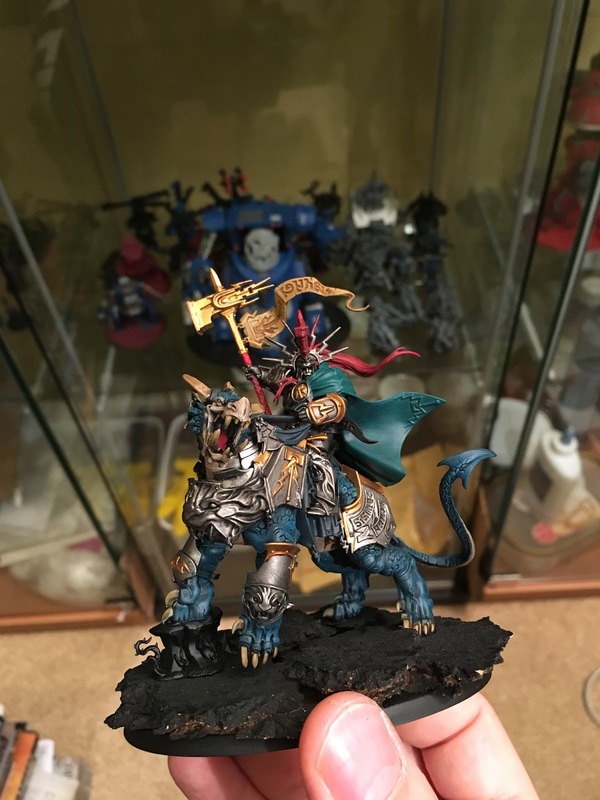 In the meantime, here are the Lord-Celestant and Lord-Relictor from february goal fully painted. I managed to finish it just two days after my last wrap up article... Can't wait to try these guys on the battlefield ! The fires of revenge burn strong in Gregorious' soul ever since he lost his leg and his beloved first ship to a Chaos Leviathan. His obsession to track and kill the monster has led him in a years long hunt over the seas of Chamon. Ever since he met Gudrun, the two captains have sworn to have their vengeance together, or dying trying. A skilled navigator and expert wizard able to call on the powers of Azyr, Ishmael was a young deck hand when he joined Pecker's unfortunate crew. Was it not for Ishmael mastery of magics, the two would have lost more than the captain's leg. Years later, when they were serving on the Venythian navy, it was Ishmael that brokered the alliance with Gudrun's duardins. The ogor maneater known as Cargo one day rowed onto Venythia docks on a salvaged rafter. He did ask for nothing, but as soon as an expedition was mounted to clear the Silverflow Straits of Bloodbound longships, he simply jumped on board a departing ship. There he met Pecker and Ishmael and though nobody knows what agreement they reached, the ogor regularly follow the two humans. I've also managed to play a game with the rest of the Grudgbreakers against the orruks of the Ironfang Fleet. You can read the battle report on Warboss Kurgan's blog. Firstly, let me apologise for the lack of updates. This is due to personal reasons. Although I have nothing to update, I do want you to know that I have not left the project. 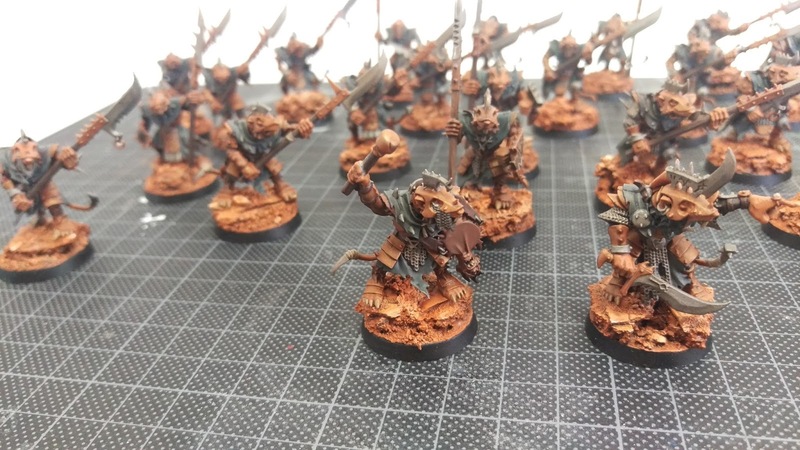 My skaven are safe and are ready to be painted. "With a crack of lightening the forces of Chaos were blinded momentarily, their charge halted and as the smoke cleared there stood immortals in huge plates of armour. The prayers to Sigmar had been answered, the Stormcast Eternals had arrived!" Yes I'm finally posting some progress on my armies for the Tales of Sigmar. Unfortunately last month I had a couple of issues come up in real life so all my hobby time was halted on both my Stormcast and Night Goblins. So I'm resetting a month behind everyone else and will be starting this month on getting everything painted up. I know I've already done my Night Goblins purchases for the 1st Month so I'm hoping to have some finalised paint jobs for those in the coming days. 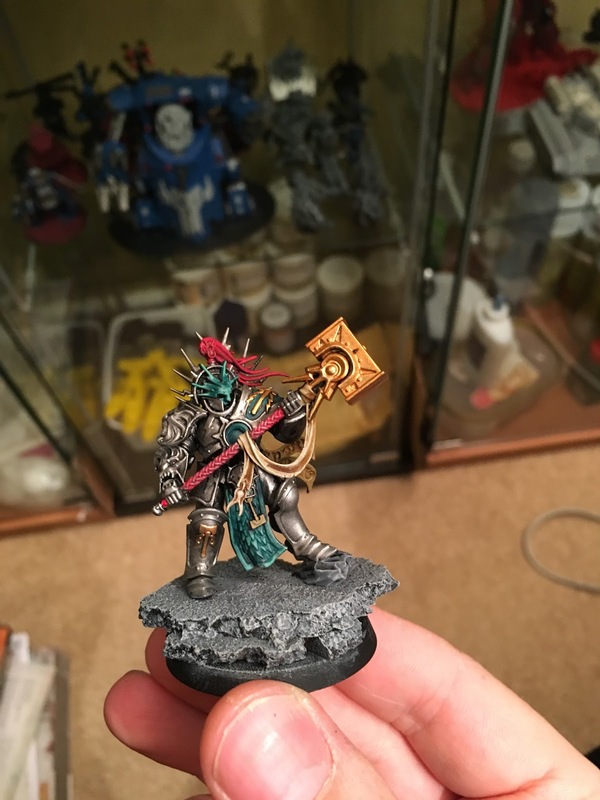 But I know I promised two armies so here's the start of my Stormcast Eternals! If I'm being honest I wasn't too keen on the models when they first launched, I'll be the first to admit I called them Sigmarines like many others. But as the other units and heroes were released I began to fall in love with them, while I'm impressed with the Prime model, it's the Knight-Venator that sold it for me, hint-hint, he'll be purchased down the line! 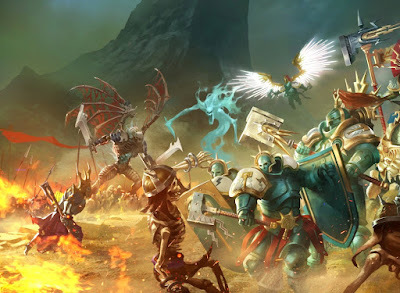 So my first purchase for Feb, for the Stormcast was obviously the guys from the Starter Set, quite a few people had these spare as they started Khorne Bloodbound armies and I managed to pick up the Stormcast for a cool £25, one of the Prosecutor's wings were damaged on the sprue and I emailed GW to see whether they do replacement wings….well I ended up getting the whole sprue sent through the post! So that was an additional Prosecutor, a couple of Liberator Primes, another Lord-Relictor and a couple of Retributors, who's to say that GW doesn't look after their customers?!? Now being a month behind in painting it does mean I've got a budget built up as I'm not planning on any purchases in March. That's not a problem though as I'll be buying the big Stormcast Expansion Box Set in April to bring me back in line. I left it at their for purchases this month, I thought that would be plentiful to keep me busy for a whole month. So I've been super-busy the first few days this month building everything, knowing how fragile the Prosecutor wings are I've managed to magnetise them for ease of transport, this was a pain in the arse to do but thankfully I got the magnets holding well. As I showed last month I've got a paint scheme in mind, I wasn't too fond of the normal gold paint scheme that featured in the starter box. I've got to admit the new Gold paint from Games Workshop is amazing for a base colour, and I've used it for the gold parts of my models. 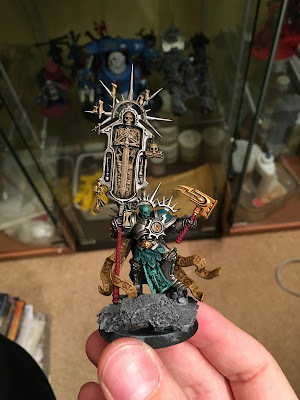 But I wanted a Silver Armoured Stormcast with teal colours and have found a recipe that's relatively easy to produce but looks quite striking. I'm still undecided for the basing but I'm seriously considering matching my Sylvaneth woodland basing so I can team the two forces up. Expect a fully painted starter set by the end of the month but for the time being here's some work in progress shots of my Lord Celestant on Dracoth, one of my Lord-Relictors and a Retributor, I painted up three different models to make sure the paint scheme I had decided upon works for the wide variety of models that are within a Stormcast army. Enjoy! This is my second arrival to the Herd of Change. Centigor. I bought a box of ten Beastmen Gor which would serve as the torsos and a box of Bestigor for more weapon and arm options. I have made five so far but another five will soon be made when I have more marauder cavalry for the horses. I was also kindly sent a load of Chaos Knight lance arms by Scott Smith(@wee_men on Twitter). The champion is based on Ghorros Warhoof and was really a fairly simple conversion. I only had to sculpt the hair around the waist and going over the back of the horse to the tail. The horses themselves just had the saddles scraped off with a knife. It took around a few hours a night for four days to convert all of them. These took about a full week to paint to this standard. I still have a few details to finish like the banner but I will do all the banners as one in the future and just keep them plain for now. 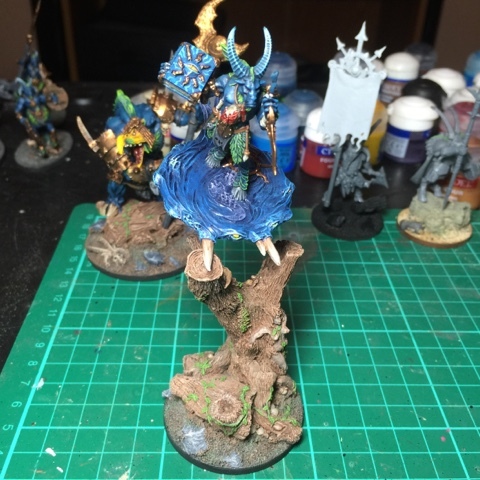 I also painted a converted Herald of Tzeentch on Disk although it took me slightly over this months budget. 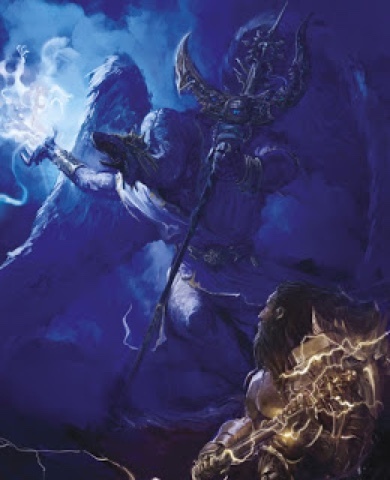 Originally I planned to use him as Malagor but I will likely use him as the Herald to summon Disks of Tzeentch. I am currently working on the five Gor and ten Bestigor but I expect they won't be finished until next month. Turns out £50 gets you more than a months worth of hobby!